In this new 12 part TV series out on DVD, Ruth Goodman, Alex Langlands and Peter Ginn take a leap forward in time to immerse themselves in an Edwardian community in the West Country. In the nineteenth and early twentieth centuries, Morwellham Quay was situated in a bustling and commercially prosperous region – a stunning rural landscape encompassing rolling farmland, wild moorland, tidal river, coast and forest, which supported a vibrant and diverse economy. Ruth, Peter and Alex spend a year on their Edwardian Farm exploring all aspects of this working landscape – restoring boats, buildings and equipment, cultivating crops. fishing, rearing animals and rediscovering the lost heritage of this fascinating era as well as facing the challenges of increasingly commercial farming practices, fishing and community events. From investigating the impact of water-powered machines and the world’s first tractor, the team engage in a whole host of challenging activities, delving into Britain’s rural heritage once again to unearth how Edwardian farmers recovered from the agricultural depression leaner, fitter and more diverse than ever before. The Edwardian Farm DVD will be available early in 2011, and is available for pre-order. We travel 3 months or so a year, mostly on guided tours. 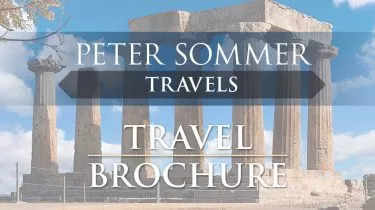 This was our second adventure with Peter Sommer Travels...."just the best" in terms of quality and service.